Our little girl is 13 months old today. She eats everything we offer her -- with the exception of vegetables these days. 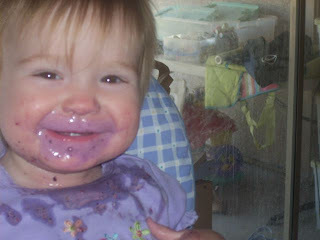 You can see her to the left after enjoying a triple berry smoothie! She isn't walking, but can stand on her own and does a fair share of deep knee bends. She spreads her legs so far apart when she stands that as she tries to move forward, she falls to the floor. We're just waiting for that first step, and I know she'll be running before we know it. She can climb up stairs with no fear, and laughs hysterically from the top and waits for someone to bring her back down the steps. She loves to look at books and to have books read to her. She especially loves books with flaps, books with photographs of babies, and a Care Bears book that has a moon that lights up when pushed. She doesn't sleep through the night, but I'm trying hard to help her do so. She outgrew the co-sleeper that was attached to her bed, so DH put together one of our cribs. It's in our room (we don't have a room for her -- and the real estate market crash means we have no equity left in our home which has put a damper on our plan for an addition -- our house lost over $50K in value in the last 6 months . . . ), but a few steps away from our bed. She starts out the night in her crib, but ends up in our bed between 1 and 3AM. Unfortunately, that means I usually end up with 25% of my body hanging off the bed and waking up with a crumpled spine. This is the first time we've had a toddler and haven't had an extra bed in the house -- with C & N I was usually sleeping part of the night in our spare bed. I'm not sure what the answer is, but it may involve me sleeping on the floor for the next couple months. We are trying to enclose our back patio to make room for our office and then give her a room of her own. Unfortunately, we can't afford to do even this at the moment. If we do that, I will move our futon back from my parents home and put it in her bedroom and we'll have an extra bed again! But, back to my youngest! She is finally over her illnesses over the last month -- (ear infections and then a staph infection) and is much happier. She nods and shakes her head appropriately. She waves. She uses the sign for "finished". She uses a sign for "yes" (which is similar to finished, but she uses only one hand.) She grunts a lot to express her desires (see video here.) She's a very friendly child and interacts with most people who come in contact with her. She loves all types of music, including N singing to her. She bops her head and dances along whenever she hears a beat of any kind. It's so much fun watching her grow and learn new things. She is just precious! I love that picture of her - adorable!